Ray Kucera and his son, Kevin, farm 2,000 acres of corn and soybeans near Cedar Bluffs, Neb. With about 70% of their cropland irrigated, they are constantly looking for ways to improve yields while making more efficient use of nutrients and seeding rates. Into their fifth year of strip-tilling corn, they are using precision farming equipment to spoon-feed fertilizer into the root zone and reducing dry fertilizer costs by as much as 50%, says Ray. Using RTK satellite navigation, they are able to accurately match their 12-row Twin Diamond Strip Cat strip-till rig and John Deere corn head with an 18-row John Deere planter pass. This is the first year they’ve tried strip-tilling soybeans. “We’re working with the Univ. of Nebraska on a study of the effects of placing the next year’s fertilizer in a band in the root zone with the fall strip-till pass,” Ray says. To accomplish this, the Kuceras equipped their two strip-till units with anhydrous knives and Raven flow valves to vary nitrogen rate and a pull-behind Montag dry fertilizer cart that can feed the prescription phosphorus, sulfur, and potassium rate into the root zone of the next year’s crop. Getting guess rows set correctly takes the most time, but once the offsets are set, they found no issue with matching up the 18-row planter with the 12-row strip-till passes. The planter was a 3-point hitch mounted 16-row stacker planter, but the Kuceras added 2 rows to make it an 18-row planter. They had to switch the wiring harness, but that wasn’t difficult, Ray says. The Kuceras have 3 John Deere displays for their precision farming work. The planter tractor and the new John Deere 4730 sprayer each use GreenStar 2630 displays for auto-steering and row shut off on the planter and 7 section control on the 100 foot sprayer boom. The planter tractor is also used for strip-till and another tractor, also used for strip-till, has a GreenStar 2600 display. The combine uses the RTK signal for the corn and soybean harvest and also for yield tracking in corn and soybeans. Their irrigation systems use a GPS signal to for corner arm extensions. 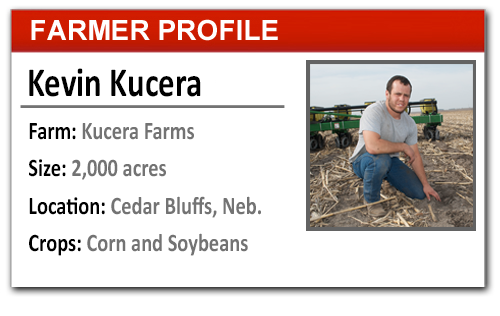 With all of their experience using precision technology, one of the challenges for the Kuceras has been getting the consistent level of support they expect from their equipment dealer. Nevertheless, they want to turn to their dealer for updates and insight on new technology innovations and whether products are worth the investment. Ray says precision technology has become an integral part of the equipment and dealer support is improving, thanks in part to their common approach to farming.